The 27th anniversary celebration of the Maiden Voyage, launched on Saturday, June 13, from the Caribbean Island of Aruba. The weeklong convocation is held annually in June aboard the Scientology Motor Vessel Freewinds. More than 200 of the most advanced Scientologists on the planet gathered in the idyllic Caribbean Islands. The weeklong convocation serves as a celebration of recent accomplishments and the setting of milestones for the year ahead. The flawless Scientology motor vessel, Freewinds, was the passport to a week of grand festivities for the 27th Anniversary Maiden Voyage. The 2015 anniversary celebration of the original Maiden Voyage launched on Saturday, June 13, from Aruba aboard the Freewinds. The island hosted a send-off party for passengers and crew to honor the occasion. Led by Mr. David Miscavige, Chairman of the Board Religious Technology Center, the Maiden Voyage Anniversary carries a particularly distinctive itinerary of international events marking a midyear report of the religion’s immense growth. During a stirring opening night celebration Mr. David Miscavige, Chairman of the Board Religious Technology Center, presented the unparalleled expansion driving Scientology inexorably forward. The Maiden Voyage cruise visited the Caribbean Islands of Aruba, Bonaire and the Freewinds' home port of Curaçao. The Scientology Motor Vessel Freewinds has sailed over four-hundred thousand miles making it the longest running passenger ship in the Caribbean. Some 80 offices and agencies have presented the Motor Vessel Freewinds and her crew nearly 400 awards during more than a quarter-century of fulfilling its philanthropic mandate on the high seas. The weeklong convocation closed with a rousing finale and the Church’s controls set on full steam ahead for the coming year—one that promises even greater and more ambitious expansion in the forecast. It’s happened every June since 1988. More than 200 of the most advanced Scientologists on the planet gather in the idyllic Caribbean Islands and board a flawless motor vessel that will be their passport to celebration and spiritual enlightenment during a week of grand festivities. And this year, the 27th anniversary celebration of the original Maiden Voyage on the Scientology religious retreat Freewinds—which launched on Saturday, June 13 from Aruba—carries a particularly distinctive itinerary. 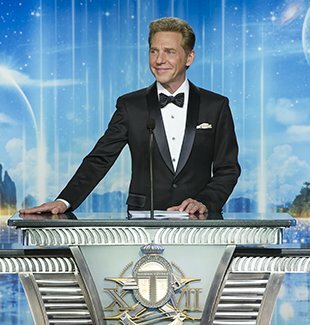 During a stirring opening night celebration, Mr. David Miscavige, Chairman of the Board Religious Technology Center, presented to those gathered for the Maiden Voyage Anniversary launch last week, the unparalleled growth driving Scientology inexorably forward. Indeed, in the Church’s midyear report, the news could hardly tell a brighter story. With new Ideal Orgs added during the past 12 months, there are now more than 40 shimmering across five continents. Furthermore, those Churches are part of a Scientology evolution that now finds the doubling, tripling, quadrupling and even quintupling of previous achievement goals. And that’s not to mention the more than 2,000 federal, state and community organizations now partnering with Scientology Ideal Orgs worldwide. Those Churches were honored over the past year with an array of accolades that spoke to their dedication to better the cities where they serve. Included therein is a Religious Merit Award from the city of Kaohsiung, Taiwan; a Russian Parliament recognition in Moscow in tribute to 20 years of Church service; a commendation from the House of Lords in London spotlighting Scientology’s work in changing the world for the better; a Mayoral Proclamation in San Francisco for fostering tolerance and equality; and accolades from the United States Congress in Washington, D.C. to honor its indiscriminate help to others. While for the Freewinds herself, passengers and crew have contributed tens of thousands of hours of humanitarian work to the islands they visit, including organizing and conducting cultural programs; sponsoring drug prevention, human rights and moral education for island youth; and playing host to benefits for a variety of community and charitable organizations. This week’s 27th Freewinds Anniversary fête serves to illuminate some of the more recent humanitarian efforts and the broader social mission of the ship in servicing its many ports of call throughout the Caribbean region itself. The declaration by the Minister of Justice in Aruba that “The Freewinds makes a real difference in the lives of human beings” with its morals education courtesy of the Church’s The Way to Happiness campaign—whose 21 precepts were broadcast to better than 85 percent of the island’s citizens via Tele-Aruba. So it went throughout the islands that the Freewinds calls home, also including Barbados, St. Lucia, St. Vincent, Dominica and Antigua. Some 80 offices and agencies have presented the vessel and her crew nearly 400 awards during more than a quarter-century of fulfilling its philanthropic mandate on the high seas. Passengers aboard the 2015 Maiden Voyage soirée also celebrated an evening dedicated exclusively to the unparalleled global efforts of the International Association of Scientologists (IAS) in calling attention to—and helping provide the solution for—some of the darkest issues confronting humanity. Tales of calm, hope and achievement centered by The Way to Happiness, where the program helped to restore sanity and order in violence-ravaged corners of Mexico, South Africa and France. The bringing of awareness and enforcement of the Universal Declaration of Human Rights—assisted by United for Human Rights and Youth for Human Rights—to areas of Bangladesh, Denmark and Guatemala. Foundation for a Drug-Free World taking on the drug abuse scourge in Honduras, Indonesia and New York City. The hard-won legal victories wrought by the Citizen’s Commission on Human Rights (CCHR) in going to the mat for thousands of children victims of psychiatric abuses and criminality in Italy, Australia and New Mexico. And so it was that by week’s end, the Scientologists assembled for the Maiden Voyage Anniversary celebration were left feeling uplifted and fulfilled—and galvanized to meet the exciting challenge of the year ahead.